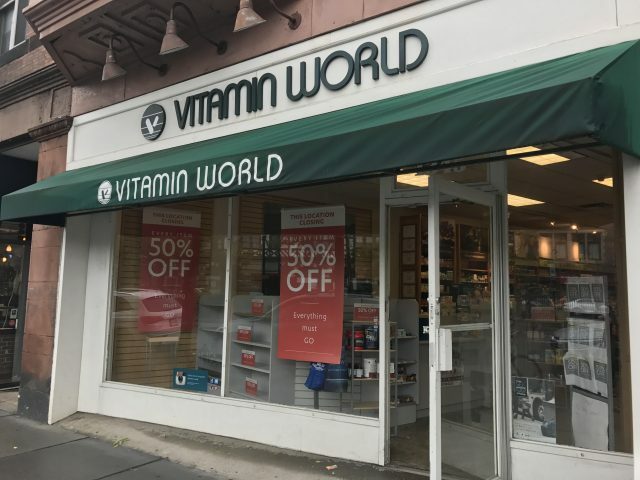 After 20 years in Coolidge Corner Vitamin World is closing its doors. The shop is holding a 50 percent-off sale and will close at the end of the month. When asked why the corporate-owned store was closing, store manager Jay Steveson said he was not at liberty to say. Vitamin World is the latest in a recent string of businesses that have closed in the area. The Associated Press reported on Sept. 19 that Vitamin World was one of at least 19 retailers that sought bankruptcy protection this year. In June, Panera surprised many by suddenly closing its Coolidge Corner branch, and in July, Lady Grace announced it would close its store in Coolidge Corner and relocate to Needham Street in Newton, which offered more parking for customers and lower rent. High rent, taxes and inadequate parking prompted the 60-year-old, family-run business to pack up and move out, the store manager said in July. On the heels of Lady Grace’s announcement, Coolidge Corner business Pier 1 Imports announced that they would be closing by the end August after 35 years at the Beacon Street location. Many Coolidge Corner businesses have cited being unable to negotiate a lease renewal as one of their main reasons for leaving. Over the past three or four years that town has heard that some rents in Coolidge Corner were surpassing rents in the Prudential Center and on Newbury Street, Economic Development Director Kara Brewton said this summer. Last fall, the vacancy rate in Coolidge Corner was 5.9 percent, which is lower than the regional rate of 9.2. Though the vacancy rate is lower than the region, it has fluctuated widely from 1.9 percent in 2012 to 7 percent in 2009. After 16 years in Washington Square, The Fireplace also announced that it would close at the end of August. Owner Jim Solomon decided to close the beloved restaurant for health reasons and because with several years left on the lease, making it desirable for buyers, the timing seemed right. New specialty food market Allium Market and Café, is set to open its doors in the historic S.S. Pierce Building in Coolidge Corner this fall.